Golden Week in Japan is a series of public holidays that happen at end of April and beginning of May. It’s one of the busiest times at Tokyo Disney Resort (also in and around Japan). Everyone is on vacation and traveling inside and outside the country. You’re best avoiding this time, if possible. But, not all is lost if you find yourself at the parks on Golden Week. 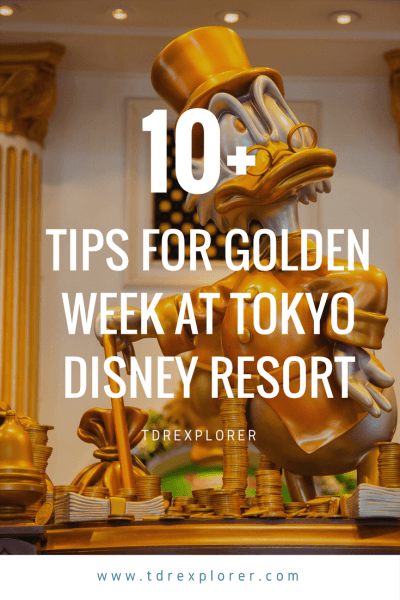 Our guide gives you our best tips and information on Golden Week at both Tokyo Disneyland and Tokyo DisneySea! Note: In 2019, there’s a special case where Golden Week is longer than previous years. I go into detail and explain what that means for you. 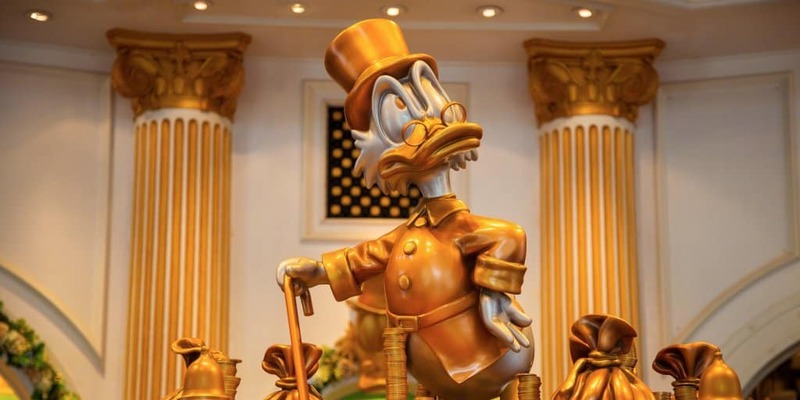 Once the Golden Week rush is over, it’s one of the best times to visit Tokyo Disneyland. The crowds are at some of its lowest, the weather is favourable, and the seasonal events are still happening! Japan has enacted a law to assign one-off holidays to celebrate the imperial succession, creating a 10-day Golden Week in 2019. The current Emporer Akihito abdicates on April 30 while Crown Prince Naruhito ascends the imperial throne on May 1, 2019. 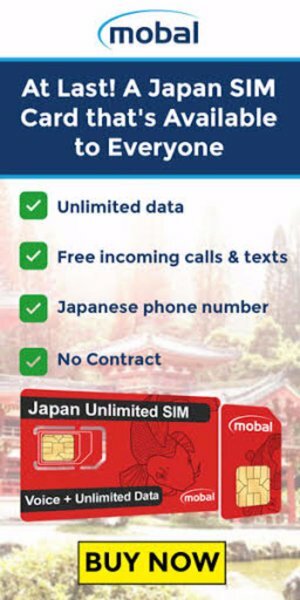 This creates a rare 10-day vacation starting from April 27 through May 6, 2019. With April 29 and May 3-6 already public holidays in 2019, April 30 and May 2nd are holidays for 2019. Any weekdays that fall between public holidays also become holidays, as per Japanese law. This means you should avoid the Parks between April 27 through May 6, 2019. End of April and the beginning of May is one of the most comfortable times of the year for weather. The temperature averages 18°C (64°F). Check the forecast before you head to the parks. If it’s going to rain then make sure to get yourself an umbrella (everyone uses them), a change of socks, and a poncho. You can pick all these up at the 100 yen shops throughout Japan. They do carry all these items in the parks but expect to pay a premium for them. What Days are Busy During Golden Week? For 2019, the crowds begin on Saturday, April 27, through Monday, May 6, 2018. Use the crowd calendar for an updated look at the predictions. Since this 10-day Golden Week (see above) is a rare event, the crowd calendar may not be accurate. It’s best to avoid all the duration of the Golden Week holiday in 2019. It’s best to visit before April 27 and after May 6, 2019. 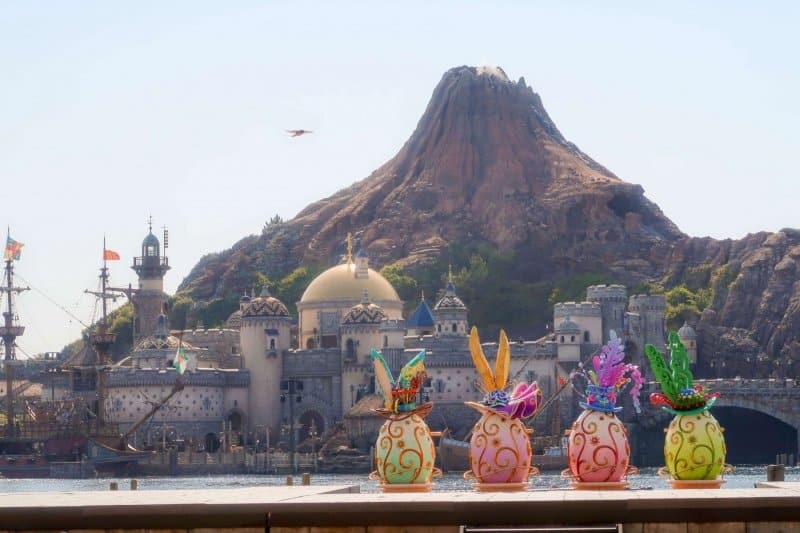 During Golden Week the resort has Disney’s Easter at both Parks. 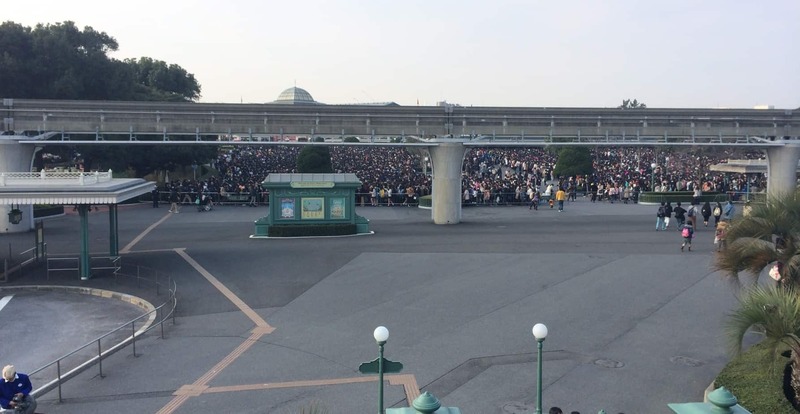 Crowds at the entrance to Tokyo Disneyland on a capacity day. Tokyo Disney Resort is popular, so it makes sense that most people who don’t go regularly want to visit for their holidays. That means, the parks are busy and on average reach capacity most days. So, what does that mean for you? 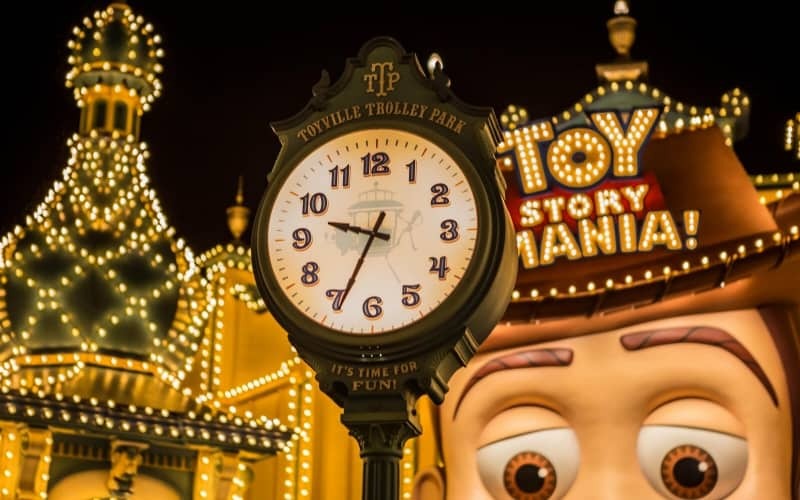 FastPasses run out early in the day (sometimes even 30-minutes after an hour after opening for the most popular attractions like Toy Story Mania!, Pooh’s Hunny Hunt, and Monster’s Inc. Consider this the pinnacle of weekends, over the span of a week. Read our weekend survival guide and our guide to dealing with the massive crowds. If you’re staying at a Disney Hotel, then take advantage of your 15-minute early entry called “Happy 15”. That small amount of time will make all the difference when getting FastPasses. But, get to the gate at least 30-minutes before your Happy Entry. There will be plenty of people ahead of you. If you are unable to take advantage of the Happy 15 entry, arrive at the park 2-hours before opening, if you want to get the best possible chances at FastPasses, or getting into standby. If the park is opening at 8:00, then get in line at 6:00. This is to make sure your best chances of getting a FastPass for one popular attraction. If you’re not that keen on getting there that early (I know the feeling trust me), then at the absolute latest get there 1-hour before park open. If you find yourself at the parks during golden week, not all is lost. Follow these tips to help make your day go smoother. The biggest tip I can tell you is to get your park tickets in advance. You’ll waste valuable time waiting in line if you buy the same day (also risk having the parks reach capacity). If you have an advance ticket you’ll be able to enter the park without any issue. Read our guide on how to buy park tickets for Tokyo Disneyland (including discount tickets). Choose one attraction and go for that FastPass. The lines are long and queues for FastPasses can reach 20-30 minutes just to get them. By the time your next FastPass is available, likely there will be none left at another attraction. But, you may luck out so keep an eye out. Grab a FastPass for Monster’s Inc then wait in standby for Pooh’s Hunny Hunt. Or vice versa. Skip Toy Story (if you have done it before in the US) and get a FastPass for Tower of Terror and get into standby for Journey to the Center of the Earth. Toy Story Mania! Fastpasses will run out on average 30-minutes after the park opens. Counter service restaurants are busy and yield long lines. You’re best eating on off-peak hours (before noon or after 18:00). There are long lines even in mid-afternoon. I suggest bringing small snacks to sustain you, to reduce the chance of becoming “hangry” (which I am known to get). If you want table service, they begin taking reservations at the restaurant starting at 10:00. I suggest lining up at the restaurant at 9:30 to increase your chance of getting a reservation. Our dining guide has all the details. 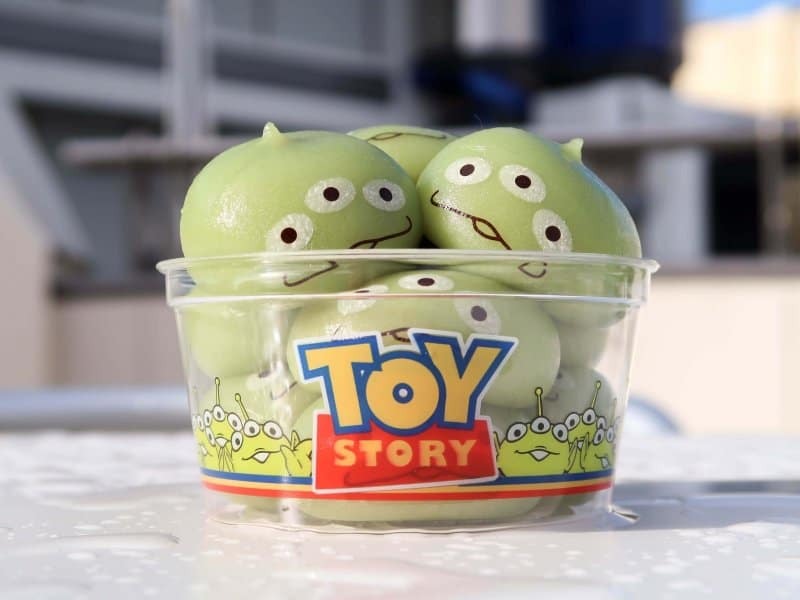 For suggestions on snacks, read our top 10 awesome snacks at Tokyo Disney Resort. Then study our top choices for counter service and table service restaurants at both parks! Some guests wait 2-3 hours for the next show (such as the parade at Tokyo Disneyland or the harbor show at Tokyo DisneySea). You, however, won’t want to do that as you want to make the most out of your day. A good 60-minutes before showtime is more than enough. While you won’t have the best seat in the house, you’ll still be able to enjoy the excellent entertainment options at the parks. Buy yourself an adorable plastic leisure sheet to sit on or use a park map as a makeshift one. 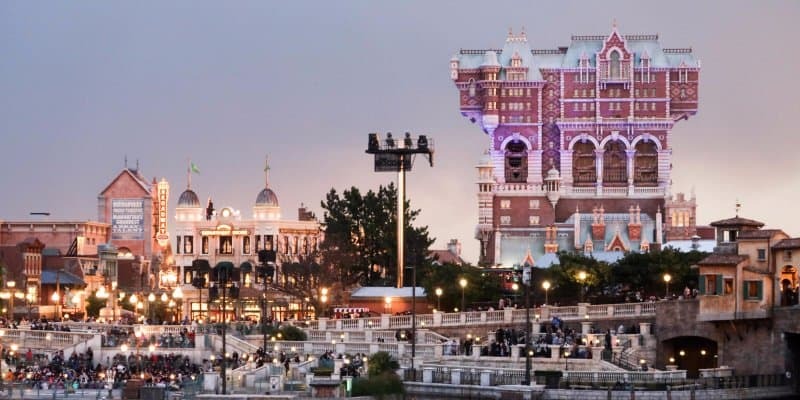 Also, don’t forget to read our entertainment guides for Tokyo Disneyland & Tokyo DisneySea. Follow these tips and you’ll be in good shape. If you can, avoid Golden Week altogether when planning your trip. If you are unable to avoid visiting during this time, you are now equipped with the knowledge to make the most of it. Have you visited during Golden Week? If you have, share your stories with us in the comments. Feature photo by Hector, visit his photos and adventures on Flickr and his blog. I like to call it organized chaos at it’s best! 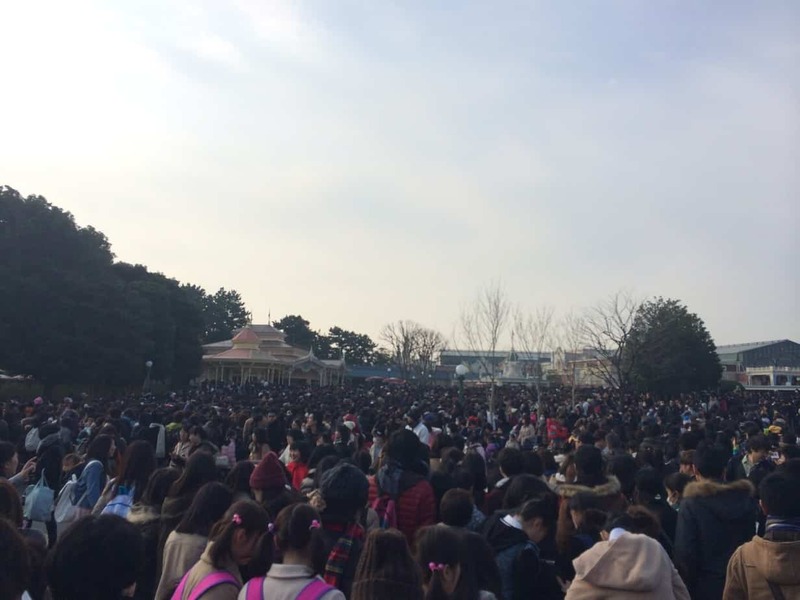 It’s quite something to see how busy it can be but not feel stressed just because of the Cast Members and the guests, they really know how to handle crowds very well. But nothing can be sitting on top of the S.S. Columbia on a nice peaceful and quiet day, that is for certain! Definitely, it’s a testament to the CMs and Guests that’s for sure! It beats high summer at DLP! Now that is just pure carnage! Haha. That was a typo on our part. It should read. In 2016, expect the crowds to start on April 29th (Friday) and lasting until May 5th (Thursday). Sorry about that and thank you for catching that. Sorry about that, and thank you for pointing it out! I assumed it was just a typo but I wanted to be 100% certain that’s what you meant because we are planning our trip for May of 2016 🙂 Thank you for all of the info you provide. It has been such a big help! I read this a couple of days ago and it was valuable because me and my friend were going to go on May 5th… i took your advice in checking the crowd report and buying tickets in advance. May 3rd was almost sold out, and 4th and 5th were fully sold out when I went to buy via the Loppi machine at Lawsons – so we are now going on Sunday where current capacity is just over half – which is also the last day of GW this year and so most people will be traveling home that day (if from outside of tokyo). What dates are you speaking of? We’re visiting Tokyo Disneyland from May 8th till May 10th 2018, but Journey to the Centre of the Earth and Tower of Terror will be closed during our trip. Do you recommend buying a Starlight ticket for Sunday the 6th, just to do these attractions? Although it is during Golden Week?